Some matches look good on paper. File this one as the latter for Philadelphia Union because of the teams’ stylistic contrasts, and keep in mind that it’s a good thing they don’t play the games on paper. When Philadelphia hosted Columbus in March, the Union conceded a ton of possession despite playing at home and walked away with a scoreless tie. That was at home. When the Union go on the road, they often sit deep and wait to counter. So what will that say about their approach on the road? Both sides enter the match with just one win in their last six matches. Columbus has looked the better of the two, continuing to play an attractive style, and last weekend, they held Seattle to a scoreless draw despite going down a man early in the match and playing in Seattle. On the other hand, Philadelphia could be a team waiting to break open. No team in the league has a larger difference between their expected goals and actual goals than Philadelphia. They just need to start closing the deal. It’s still early enough in the season. Perhaps we can be surprised. Columbus plays the most possession-oriented style in the league, and it starts at the back. They like to play the ball on the ground out of the back, even when pressure is on their goalkeeper, former Union Academy player Zack Steffen. It makes them vulnerable to teams that like to press high, something the Union seldom did in their last matchup. From there, left back Milton Valenzuela and right back Harrison Afful like to get way up field to give the team width. To put it in perspective, Afful has taken 21 shots through nine games, enough to make him the only defender in the league’s top 25 in shots taken. Often, those fullbacks are on the receiving end of long switches from center midfielders, Wil Trapp and Artur, who serve up long balls as well any midfielder in the league. During their March match, they carved up the Union with long diagonals until a tactical change from Union head coach Jim Curtin shut that down. Ahead of them, Federico Higuain is the league’s craftiest playmaker, and striker Gyasi Zardes has done a fairly good job of finding space for shots from the striker position. Mike Grella is the wild card here. He scored in his first appearance for Columbus, but has played just 25 minutes so far in the last year. A successful injury comeback would give Columbus a brand new weapon. Much like the Union, Columbus is in the midst of a stretch in which they play three games in eight days, so we will probably see some squad rotation from Columbus. The Union haven’t won a road game in nearly a year. Their last road win was May 13 of last year against D.C. United. Is this the day they break that streak? Much depends on how they play the game. If the Union sit deep, we could see a monotonous match in which Columbus controls 70 percent of possession and the Union just try to hit a goal on the counter and hold on for dear life. But if they press high, it could be a fun, wide open match. Higher risk, higher reward. The Union have the attacking talent, but do they have the legs in a stretch like this? The key will be whether the Union attackers can get uncorked. David Accam has killed Columbus throughout his career, but through eight games, he has not a single goal or assist for the Union. Union striker C.J. has looked snake-bitten, while Borek Dockal has played one good game and failed to get on track otherwise. Injury report: OUT: DF Richie Marquez (sports hernia surgery); QUESTIONABLE: DF Fabinho (right meniscus surgery). Columbus goalkeeper and center backs vs. defensive pressure from the Union attackers. Columbus goalkeeper Zack Steffen and center backs Jonathan Mensah and Lalas Abubakar generally play the ball on the ground out of the back, even under heavy pressure. In the process, they have surrendered some key giveaways that have turned into goals. C.J. Sapong is one of the league’s best defensive forwards. The problem is the attacking midfielders behind him haven’t always met his standard. Don’t be surprised if attacking midfielder Anthony Fontana sees significant minutes, as this is the type of situation in which he can thrive. Then again, Union head coach Jim Curtin has proved time and again he does not go much for squad rotation. The Union are a very right-sided team due largely to right back Keegan Rosenberry’s excellence in possession and the lack of an attacking counterweight at left back. It has, at times, disconnected Accam from the game, and he has routinely forced his way toward goal out of seeming frustration or impatience. Accam has been a Columbus-killer throughout his career in part because Afful gets so high up field that it makes them vulnerable. The Union need to make Accam an integral part of the possession game, not just a guy who gets the ball in occasional isolations. The Union’s unimaginative road tactics have come to define this team over the last three years, and they have shown little sign that they’ll be changing them. That said, tactics are just part of the game. 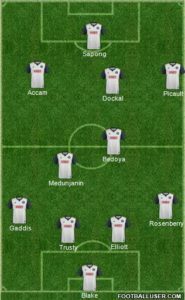 If Sapong and Accam start finishing, this is a brand new team. Really need to have Fabinho or Real this game, would also like to see at least 1 if not both of Jones and Fontana. Expected highlight tonight: One of the Assistant Referees gets bored with the game and breaks out into Aqualung. snot is running down his nose….. I thought Grella ould have been a good pick up for the Union. Always liked him. Really interested to see him and Zardes, who I haven’t really gotten the chance to see in Columbus this season. I think Union score, but otherwise agree with a Columbus win prediction. 2-1. I want goals from the run of play. I don’t care if we lose 5-3, as long as our 3 come from actual soccer activity. Is that too much to ask? News Roundup: Have You Met Jack? NYRB Says no Henry and John Brooks the Striker?